healthy green leafy vegetables. Do you know that you should be eating more greens daily as they are a storehouse of fibre, disease fighting vitamins and minerals, helps control weight and diabetes and keep your heart healthy? Yes, but do you try to indulge into these greens? Most of us find it too boring to eat or find it difficult to make them a part of our daily meals the healthy way. Learn this art here without making much changes in your daily cooking. Try your hands on Cabbage Masala an unusual preparation with good amounts of fibre and Vitamin C. Or you may try Carrot Methi Subzi if you are looking for a healthy dry subzi. Radish Muthia and Green Peas Subzi a unique combination of fibre-rich green peas with nutritious muthias, rich in Vitamin A and C.
On days when you feel like enjoying a gravy based subzi with leafy veggies you should definitely try Hara Bhara Khumbh a nutritious low cal recipe that helps to balance cholesterol levels too. Beetroot Tikkis in Spinach Gravy is one more interesting and unusual treat which is sure to tickle your taste buds. Enjoy a whole new world of healthy subzis with a variety of greens in this section. 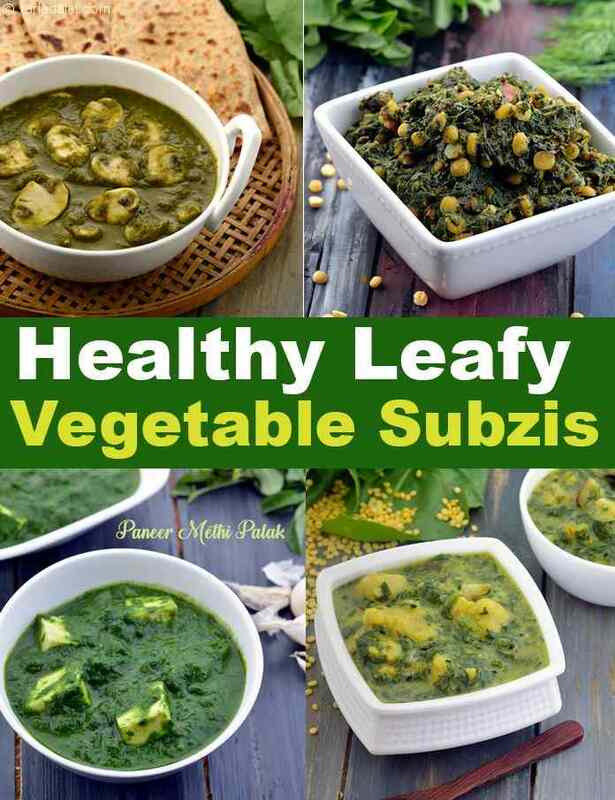 Enjoy our collection of Healthy Subzis with Green Leafy Vegetables recipes and Healthy Subzi articles below. A unique way to prepare cabbage filled with spinach and creamy stuffing and baked.